Having heard good news on the job front I pedaled off toward Noe Valley for provisions for a steak date I had made earlier in the week with one of my favorite Texan gal pals. Still hoarding Dr. Adam J. O'Donnell's (PhD) immersion circulator like a hoard-y hoarder, I figured this cut would be ideal for sous vide: it's a large enough chunk of meat that is lean and does not get a whole lot of work. In other words, the flavor is pretty light and it is susceptible to over-cooking due to the lack of fat and connective tissue throughout compared to more "beefy" cuts like a ribeye or hanger steak. So, why not cook it for 24 hours? The gal had to raincheck, so me and my roommate ended up cooking this up for breakfast - after the steak was "in the bath" for 16 hours at 129ºF. Her loss! Texas 0, San Francisco 1. 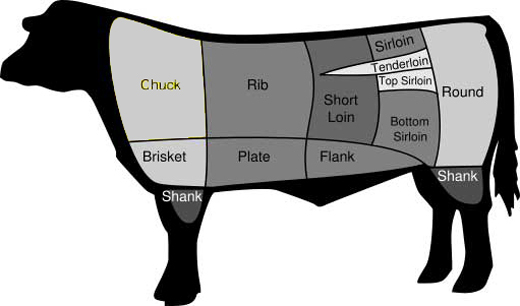 1 1/2 to 2lbs beef chateaubriand, filet or strip steak (you may need to truss it with butcher twine). 1/3 cup of wild or foraged mushrooms cut into uniform pieces. In a large zippable freezer bag, add above. Remove as much air as possible before sealing the bag. Cook in a water bath at 125-129ºF for at least four hours. Reserve mushrooms, shallots and liquid and set steak on a drying rack over a plate to collect any juices. 3 tablespoons coarse, freshly cracked peppercorns. 1/3 cup wild mushrooms cut into uniform pieces. Sous vide juices, shallots and mushrooms. Splash of good red wine. Press crushed peppercorns into the steak, reserving about half a tablespoon of pepper for sauce. In a very hot large sautée pan, melt bacon fat then sear the fatty edge of the steak to render off some additional fat. Sear the steak on the most presentable side first - this will be your "presentation side". Sear for a couple of minutes until a nice crust forms. Flip and do same for obverse. If you do not wish to sous vide, you can do this with a raw steak with the added step of roasting in a 300ºF oven for about 15-18 minutes (remember: if you are unsure, you are always fix undercooked but you can't fix overcooked). Remove steak and place on a wire rack over a plate to collect any juices that run off. Return sautée pan to high heat. Sautée raw shallots and raw mushrooms for a few minutes until edges are brown (5-6 minutes). Add reserve sous vide liquids and any juices that have run off. Reduce to 1/3rd volume and add a splash of wine and all of the cream. Reduce by half then remove from heat. Mount with butter and adjust seasoning. Spoon over steak and serve. 10-12 3-4" fingerling potatoes, halved lengthwise. Oil (about 3 tablespoons) to coat potatoes. 1/4 cup of arugula, rinsed and dried. Coat potatoes with oil and salt and place cut side down onto an oiled cookie sheet. Bake at 400ºF for about 40-50 minutes, turning potatoes after about 35 minutes. Arrange potatoes in a serving dish and strew with arugula. 1 package of frozen baby spinach (what? I'm lazy). 1 package of frozen kale. 1 teaspoon of fresh ground nutmeg. 3 tablespoons of unsalted butter. 2 tablespoons of AP flour. 1/3 cup of heavy cream. Melt butter in a large skillet over medium heat. Add flour. Integrate the flour into the melting butter until a smooth roux forms and allow to cook for a minute. Add spinach, kale and nutmeg. Add water and allow steam to thaw the greens. Once greens are thawed, add cognac and cream. Simmer for a few minutes until liquid thickens. Adjust seasonings then serve. Post-script: so, how does a steak cooked for 16 hours taste? The inspiration for even attempting to do this comes from an article I read long ago in one of those glossy covered food magazines talking about the then nascent genre of "molecular gastronomy." Writer and scientist (and Noe Valley resident, apparently) Harold McGee discusses cooking a beef tenderloin in a submersion bath with his typical barely concealed nerdy glee, noting with wonder that although the meat will be bright red as if it were just pulled out of the display case at the butchers it would in fact me cooked all the way through. The immersion circulator, a scientific laboratory tool, had been co-opted by "food hackers" to solve forever the problem of doneness. In a typical kitchen, gauging the doneness of your steak requires a degree of guesswork: eyeballing, poke tests. The only way to be sure is to use a meat thermometer. The "sous vide" approach neatly settles the matter: 129ºF is 129ºF, 135ºF is 135ºF and so on. Just as advances in making music have garnered complaints that technology was taking the soul out of music (can you believe that this same complaint had been made about the electric guitar, an instrument whose soul bona fides are no longer questioned? ), molecular gastronomy has its detractors (Alton Brown being one notable voice, ironically, as he is seen as an acolyte to McGee). So, how does it taste? Well, the steak was cooked thoroughly at what I would consider the high end of medium-rare despite the cooking time. More interesting to me was the degree to which the cognac and other aromatics penetrated the meat. What little fat the roast had was nicely gelatinized at the end of this process. This was certainly a revelation to my palette, and that elevated a rather humble roast to something greater. Am I likely to do this experiment again? Probably not frequently. However I will probably use this to cook a pork loin - a cut I am not afraid to serve medium-rare whereas others may not be so brave. The next experiment I have planned is to slow-cook chicken at about 150ºF, underdone according to the American palette, then batter and fry it quickly to finish the cooking. Stay tuned!